Keynote Speaker Dr. Anthony Cannon describes the economic and human costs of diabetes. The New Jersey Diabetes Leadership Forum keynote presenter was Dr. Anthony Cannon, who discussed the economic impact of type 2 diabetes in New Jersey. Dr. Cannon made clear that prevention and effective treatment could significantly cut the costs of treating diabetes, but that without reforms New Jersey would face enormous costs to combat the disease. Dr. Cannon’s most striking figures included an estimated $68.6 billion in indirect diabetes costs per year, and a cost of emergency room care for untreated diabetes of over $1,250 per hour. 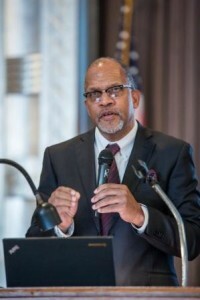 Dr. Cannon, a former member of the American Diabetes Association’s African-American Initiative Committee, also made a clear case for outreach to minority communities, because uninsured African-Americans visit the emergency room 75% more than similarly situated populations. As an endocrinologist, Dr. Cannon grounded his economic analyses in experience treating patients face-to-face, and linked poor diabetes management with doctors who failed to treat their patients with respect. He identified denial, depression, and despair as major obstacles to patients receiving the best diabetes treatment, but expressed hope that the state could combat diabetes through better policy going forward. The most striking aspect of Dr. Cannon’s presentation was his ability to link face-to-face interaction with the overall economic costs of diabetes. Dr. Cannon’s presentation would have been powerful even if limited to the statistics and analysis he presented, but those costs become palpable when he told the story of a woman who had gone untreated because she felt shamed and unwelcome at her previous doctor’s office. The woman, who had begun to present serious “Charcot foot” swelling symptoms, was quickly able to regain control of her blood glucose levels with medication and lifestyle change. While she was able to avoid the immediate health risks of diabetes, her mistreatment at a previous doctor’s office risked serious harm to her health and enormous medical costs. Dr. Cannon used this example to call for better training and engagement between providers and patients, with greater understanding of the human touch when treating diabetes. Applied to New Jersey’s diabetes challenges, Dr. Cannon’s comments underscore the need for improved communication among providers, since a more robust system of providers might have caught the failure of her first doctor. Patient-Centered Medical Homes and Medicaid Health Homes are both significant ways to improve communication among providers, and prevent the serious health risks and costs that accompany untreated diabetes. On the patient side, education programs like DSME (Diabetes Self-Management Education) and DPP (the Diabetes Prevention Program) might have helped the patient recognize her symptoms as serious much earlier, or provided coping strategies to deal with an unhelpful doctor and the stress of a chronic illness. Clearly, New Jerseyans will need more efficient and effective medical care to avoid the worst human and economic costs of diabetes, but well-researched solutions already exist to tackle these problems.